Ukraine in January-February 2018 exported 84.23 thou. 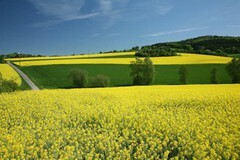 tons of rapeseed, which is 29.89% more than over the same period last year. The State Fiscal Service of Ukraine reports that the major importers of Ukrainian rapeseed in the reporting period are Portugal (USD 16.82 million), the Netherlands (USD 11.09 million) and Israel (USD 2.87 million). Exports to these countries amounted to 38.47 thou. tons, 25.38 thou. tons and 6.56 thou. tons, respectively.